What's that you say? One of my favorite movies is being turned into a play? It can't be true right? Well it is my friends. Terms of Endearment, which is based on the award winning film of the same name, is set to make it's U.S. premier this Fall at the 59E59 Theatre. 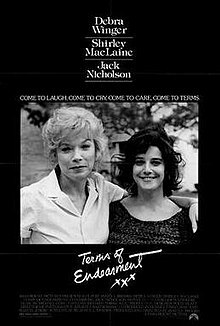 Written by Dan Gordon, and directed by Michael Parva, Terms of Endearment will play Off-Broadway at the 59E59 Theatre from October 29-December 11. Now for those of you who have never seen the movie, all I can say is that it is a real tearjerker. Here's hoping the play is just as good. Fingers crossed. Tickets for the show are now on sale. Oh and did I mention that we will be selling them? Well we are. Get your tickets to see Terms of Endearment at the 59E59 Theatre. I can't wait. Until next time theatre fans.